A 44 year-old man has been fined £120 after pleading guilty to transporting waste without the necessary licence. The offence was discovered during Operation Highway, a multi-agency operation between the Environment Agency, Nottinghamshire Police, Driver and Vehicle Standards Agency (DVSA), HM Revenue and Customs, Nottinghamshire Fire and Rescue Service and Via East Midlands. He was caught transporting controlled waste without a licence during the multi-agency road stop on the A1 at Blyth in Nottinghamshire. Police directed him to pull in to a check point at the services where the vehicle was examined and confirmed to be carrying waste. After providing various different names, and claiming to be working for a number of different companies, the driver finally identified himself. Anyone transporting waste as part of their business, whether it’s their waste or someone else’s, has to register for a Waste Carriers Licence. We want householders and businesses to only use licensed waste carriers. Large companies have an important role to play in protecting the environment by only using legal waste management contractors. We hope the legitimate carriers in the industry see that we are taking action against free riders and illegal operators who seek to evade the system. Operation Highway and its sister operation; Operation Transporter are taking place regularly throughout Nottinghamshire on all classes of road. As this case shows, unregistered waste carriers face a greater risk of being caught and prosecuted as a result of these operations. 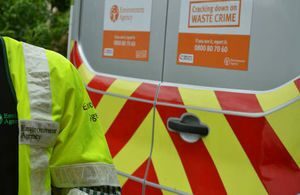 Members of the public can report unregistered waste carriers or illegal waste sites to the Environment Agency, in confidence on 0800 80 70 60 (24/7 service), or anonymously to Crimestoppers on 0800 555 111.